Here, we challenge and support medical students and residents to build on their knowledge of pharmacy and physiology to provide exceptional anesthesia care and pain management. 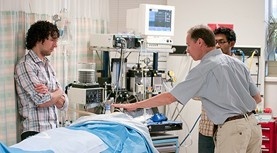 Over one hundred anesthesiologists perform more than 49,000 procedures annually at five hospitals and health centres in Nova Scotia and New Brunswick. Our department members are international leaders in their fields, shaping the future of pain management, perioperative care, airway management and patient safety. Residents, medical students, fellows, faculty and health professionals can expect exceptional educational experiences in the Department of Anesthesia, Pain Management & Perioperative Medicine. We ground our programs in the latest research and developments in medical and health education, and make continuous improvements based on evaluation. We foster a strong, dynamic, growing and inclusive research program where research careers flourish. Researchers benefit from a culture of curiosity and collaboration, an enhanced research profile among the communities we serve, an informed plan that builds research capacity and guides our success, and an appropriately resourced program that facilitates our achievements, individually and collectively.